NTU Visual Arts Society News Blog: Come join our Main Committee! Come join our Main Committee! I'm sure that you have seen our posters pinned up around school, but in case you haven't, here it is! 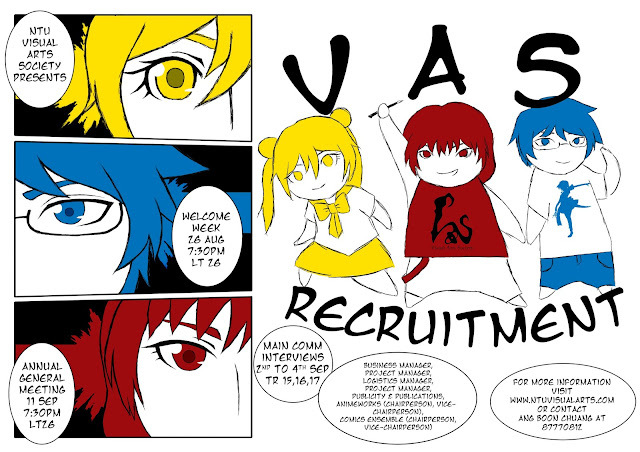 Of course, we are still recruiting members to come join our Main Committee for the academic year 2013-2014. o if you have an interest in drawing or watching anime, or just love Japanese pop culture in general, do come down and join us in our big family! Hope to see you there! Also, be reminded that our Annual General Meeting will be on the 6th of September, which is a Friday.